In this new edition of the management classic, the authors explore in-depth the core values of the culture that have made Nordstrom synonymous with legendary customer service. 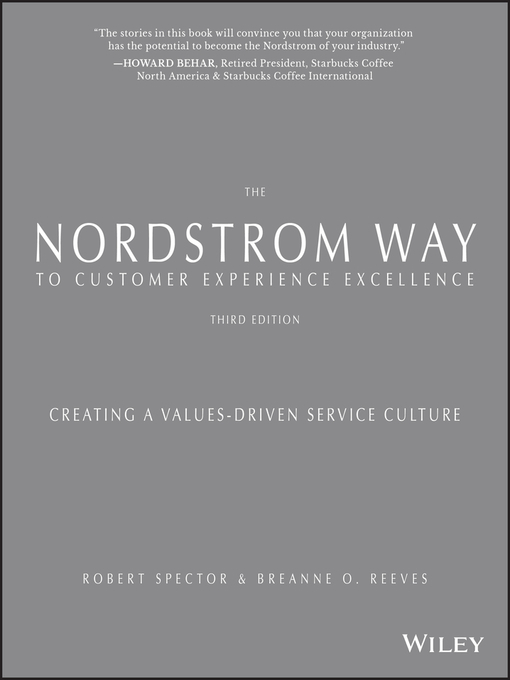 These essential values have enabled Nordstrom to survive and adapt to dramatic market shifts regularly since 1901, and the new edition explains how the Nordstrom approach can be emulated by any organization—in any industry—in every corner of the world. This is not a book about selling shoes or clothes or cosmetics or jewelry. It is a book about how underlying values such as respect, trust, compensation and, even fun, are the building blocks of a culture where employees are empowered to consistently deliver a world-class experience to customers. Nordstrom believes that the employee experience determines the customer experience, and that when you attract and reward people who are comfortable in a service-oriented culture, then everyone succeeds—both individually and collectively. No wonder Nordstrom is one of only five companies to make Fortune's "Best Companies to Work For" and "Most Admired" lists every year since those surveys have been taken. With new interviews from senior Nordstrom executives and family members, the book explains how to successfully respond to today's tech-savvy, time-crunched customers who demand a convenient, seamless, painless, personal experience across all channels. Nordstrom gives its frontline people all the digital tools necessary to satisfy the customer—and your organization must do the same, if it wants to adapt.